Live rock versus dry rock… which one costs more? You’d think the answer is obvious, but there is more to consider. When setting up a new system with dry rock, as opposed to using live rock, it’s important to know that the ecosystem is barren. There is no life in the aquarium, no bacteria to consume waste, no microfauna to pick and consume organics. There are no pests to be concerned with. There’s nothing, period, just rock. 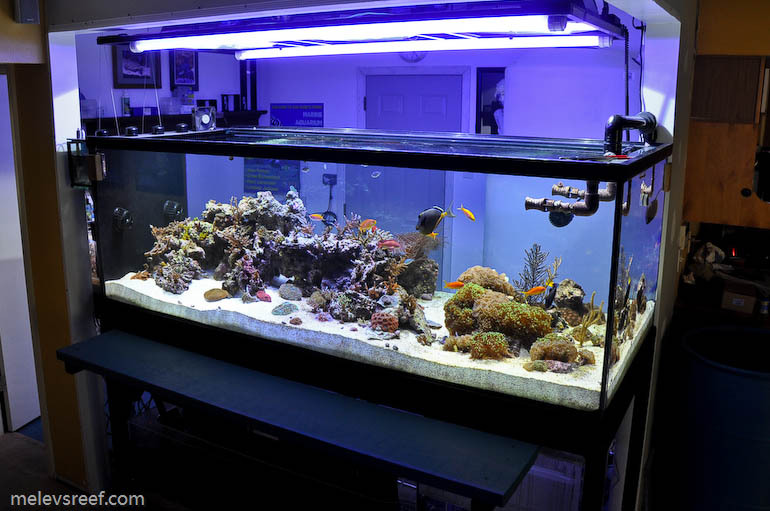 Either man-made or quarried from the earth, putting a rock structure in an aquarium does not make it a reef tank. provide alternatives: dry rock. It shipped cheaply because with no water content, it was less weight and didn’t need to be overnight shipped. It could be glued together into any configuration, and provided lots of nooks and crannies to affix coral to. 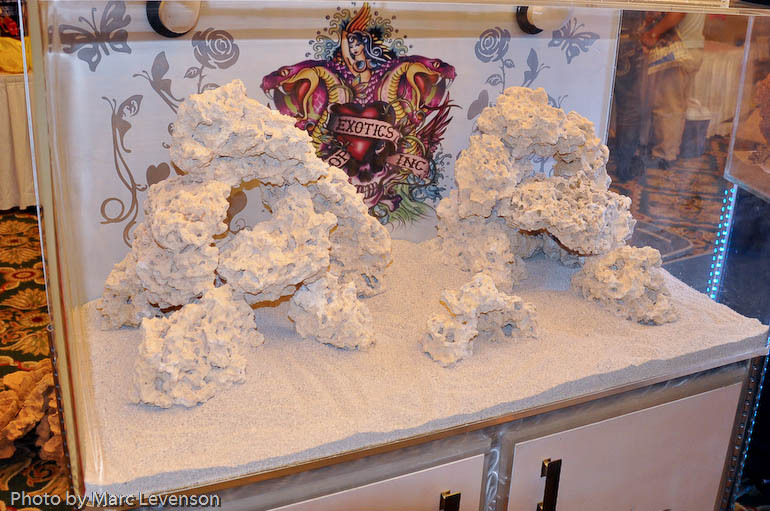 The tide has truly changed and more and more hobbyists are setting up displays using dry rock instead of live. I’m naturally concerned. 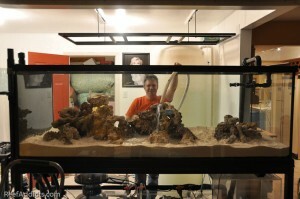 Frequently, I encounter aquarists that have set up their tank with dry rock, added sand, salt water, all the necessary equipment to filter the water, provide adequate lighting, and then seemingly raced to add livestock – partially to fill it up with color and activity, but mostly to hide the barren rock from view. That dry rock will change color for sure, but that takes time. Part of the natural process of establishing a new tank (that is growing toward maturity) are the various algae phases. These grab onto the rock and quietly spread, to the owner’s disdain. Added snails and hermit crab can fight back to keep it from getting out of control, but new fish become available at their favorite store, and there’s always room for just one more, right? Is there, really? 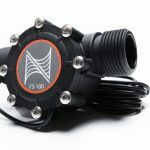 Can the mechanical filtration of the system keep the water clean enough to support life properly? I ask this because a tank filled with dry/base rock won’t have suficient bacterial filtration for a good long time. 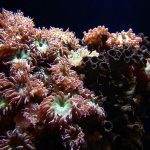 It will take many months to get to the point that the rock has the pod and bacterial populations necessary to help process the tank’s bioload. This is critically important to the livestock — to thrive, not simply survive. A system set up with dry rock needs months to grow in, and too much livestock too soon is a recipe for disaster. Forget about Murphy’s Law, we are dealing with laws of nature. If you set up a tank and add livestock before it can truly handle the load, stuff will die. Time will pass, the tank will mature, and new livestock will do better. 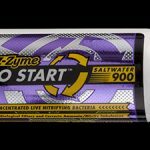 The question is, did the newer batch of livestock do better because you have more experience, or because the ecosystem has had more time to develop? Possibly both, but at what cost to life and your expendible income? When talking about cost, think about what it costs in time, what it costs in replacing livestock, what it costs in terms of morale & frustration, and what it costs to buy various fixes to correct problems that could have been avoided with a little more patience. 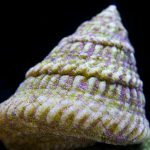 Closed ecosystems have no way to export waste, requiring hobbyists to do so via gear that they clean out frequently as well as with water changes. Don’t leave out the price of those choices of media that promise better water quality – we all use them, and we pay for that as well. 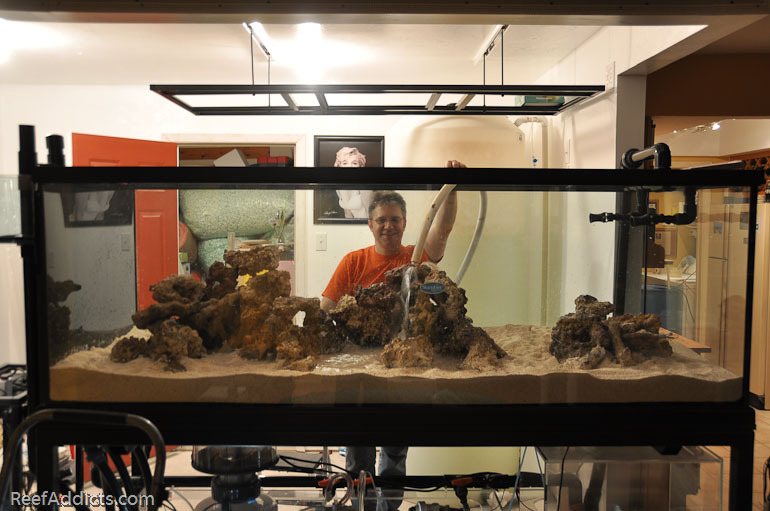 When I set up my new 400g system, I used all live rock. 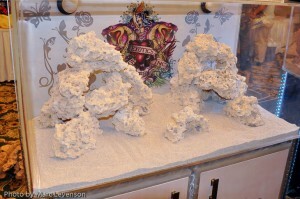 I put the rock on new dry sand, and added newly mixed (and aged) saltwater mixed up to 35ppt solution. Once the system had circulation, I added 80 lbs of live sand to seed the new sand bed. The live rock also seeded the sand somewhat, as bugs and pods scurried into the new substrate. I was able to add livestock from holding tanks to the new aquarium without concern. Watching water parameters for the next couple of months, and being selective in what new items I acquired, I made sure not to overpopulate the tank too quickly. With a big tank, one might assume that my choice would be to add some big tangs or rabbit fish, but I prefer tiny fish that shoal around the rock structure. A bunch of tiny fish won’t pollute the water as much as a couple of big tangs– this can be seen with the naked eye. Had I used dry rock, I would have had to wait three to four months before putting in the same bioload. After waiting, I’d have to be even more cautious to gradually add more fish, knowing the rock won’t be beneficial for some time. Putting one or two pieces of live rock in a system filled with dry rock will not seed it quickly enough; You Have To Wait For Nature To Run Its Course. So, how much time do you have? 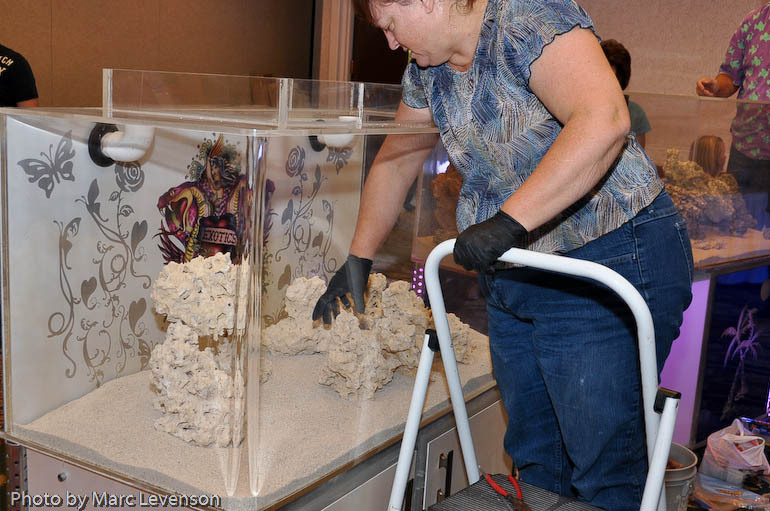 If you are the patient type of reefkeeper, dry rock is the way to go economically-speaking. If you prefer instant gratification and want to add things more quickly, live rock is still the best method. 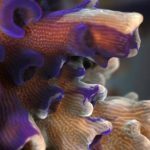 Regardless of choice, remember the mantra “Nothing good ever happens quickly in a reef tank.” In the end, we are talking about good husbandry. How does your husbandry measure up? Take a minute to think about that, do the math, and adjust accordingly for success. 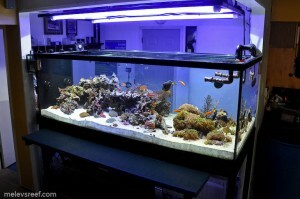 My tank turns six months old August 6, 2011. I had a good skimmer from the beginning and I guess that probable saved me from having any losses.Also all my fish were small. How do you define the term live rock Marc? Live rock is the kind you purchase that is cured and ready to use. It can come from other hobbyists nearby or your local fish store’s holding vats. I’ve used LR in all of my tanks since I set up the 29g so many years ago. Robot Octopus. You have all been warned.